This is a post I wrote three years ago as a guest writer for a blog called Closet Botanist. That blog has since dissolved, hence the re-post. This year, we returned to the location in the Boise Foothills where I encountered the plant that inspired this post. I found what might be seedlings of the tiny plant. If that’s the case, the phenology is a bit delayed compared to three years ago. I’ll check again in a week or so. Until then, meet Idahoa. I have taken a real liking to tiny plants. So many of the plants we regularly interact with are relatively big. Large trees loom above us. Tall shrubs greet us at eye level. Flowering perennials come up around our knees or higher. But how often do we get down low and observe the plants that hug the ground or that reach just a few centimeters above it? Turf grass is ubiquitous and groundcovers are common, but among such low growing plants (or plants kept low), even more diminutive species lurk. It was a hunt for a tiny plant that sent me down a certain trail in the Boise Foothills earlier this spring. Listening to a talk by a local botanist at an Idaho Native Plant Society meeting, I learned about Idahoa scapigera. A genus named after Idaho!? I was immediately intrigued. Polecat Gulch was the place to see it, so off I went. Commonly known as oldstem idahoa, flatpod, or Scapose scalepod, Idahoa scapigera is the only species in its genus. It is an annual plant in the mustard family, which means it is related to other small, annual mustard species like Draba verna. It is native to far western North America and is distributed from British Columbia down to California and east into Montana. It occurs in a variety of habitat types found in meadows, mountains, and foothills. Idahoa scapigera is truly tiny. Before it flowers, it forms a basal rosette of leaves that max out at about 3 centimeters long. 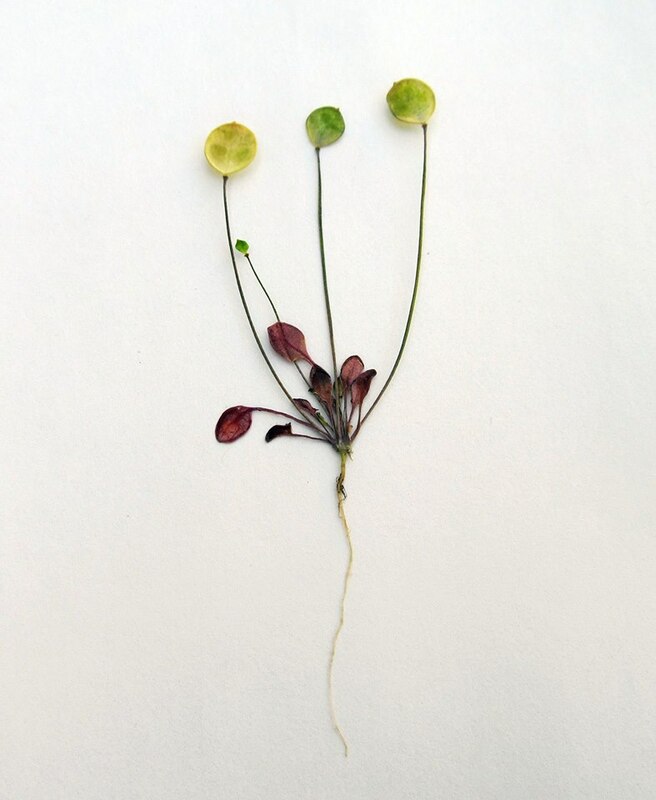 Next it sends up several skinny flower stalks that reach maybe 10 centimeters high (some are much shorter). One single flower is born atop each stalk. Its petite petals are white and are cupped by red to purple sepals. Its fruit is a flat round or oblong disk held vertically as though it is ready to give neighboring fruits a high five. Happening upon a patch of these plants in fruit is a real joy. Which brings me to my hunt. It was the morning of March 20th (the first day of Spring) when I headed down the Polecat Gulch trail in search of Idahoa, among other things. The trail forms a loop around the gulch and is about 6 miles long with options for shortening the loop by taking trails that cut through the middle. I have yet to make it all the way around. Stopping every 10 yards to look at plants, insects, and other things makes for slow hiking. I was about a half mile – 1 hour or more – into the hike when Idahoa entered my view. A group of them were growing on the upslope side of the trail, greeting me just below waist level. 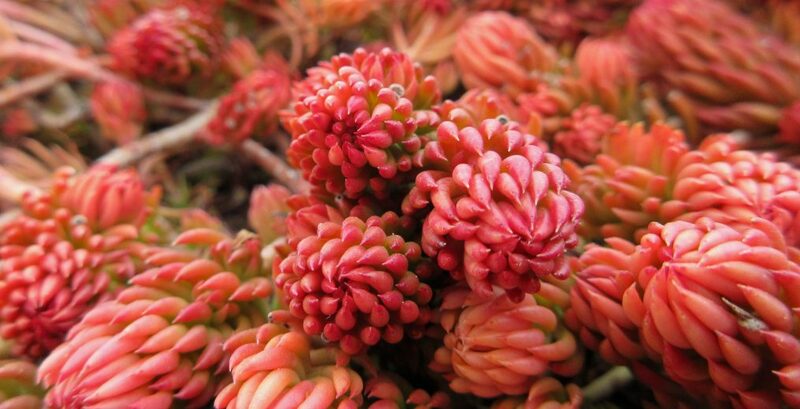 Many of them had already finished flowering and had fresh green fruits topping their thin stalks. At this location they are a late winter/early spring ephemeral. I made a mental note of the site and decided to return when the fruits had matured. Next year, I will head out earlier in hopes of catching more of them in flower. 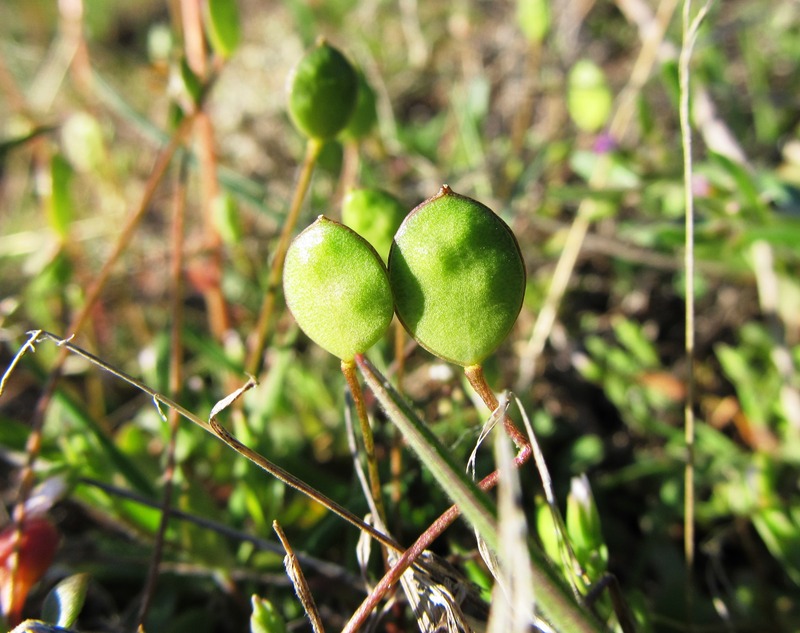 On the way to Idahoa, I noted numerous other small, green things growing in the sandy soil. 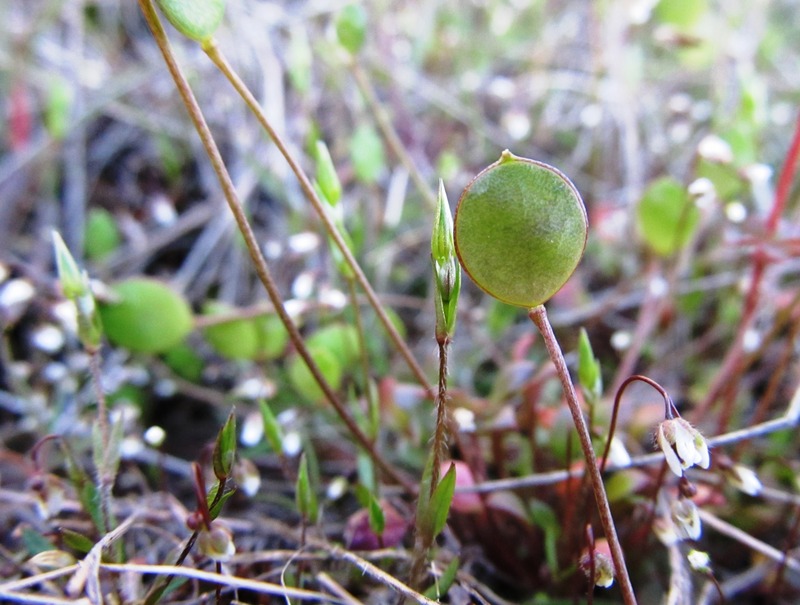 It turns out there are countless other tiny plants to see and explore. It got me thinking about all the small things that go unnoticed right underneath our feet or outside of our view. I resolved to move slower and get down lower to observe the wonders I’ve been overlooking all this time.